Walter Beasley - The Best of Walter Beasley | The Affable Years, Volume 1 - TheUrbanMusicScene.com | Music Reviews! Once upon a time, a particular nine year old received a life-changing gift of a Grover Washington, Jr. CD. From that moment on, Walter Beasley would dedicate his career to shear excellence — all for the love of music and for the legendary saxophonist they call Mr. Magic. Besides managing his own publishing company, his own record label and an over two decade residence as a professor at the Berklee College of Music, Beasley has crafted his own saxophone magic with over three decades of consistent charting on the Billboard Contemporary Jazz Charts. The comparisons to Washington, Jr. are quite understandable with Beasley’s shear mix of jazz and R&B recording with artists, such as Stephanie Mills, Norman Brown, Brian McKnight and Everette Harp. Though it is Beasley’s overall musicality which is especially held in high regard, even producing a Hip-Hop Improvisational DVD through his Affable Publishing. 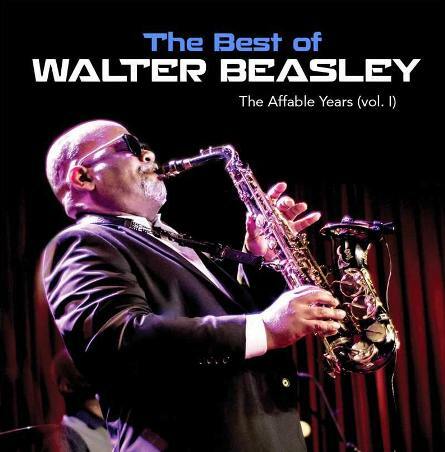 With his second greatest hits package, the first compilation going back to 2005, Beasley offers Volume 1 of The Best of Walter Beasley from his Affable Records catalog, plus a bonus track. True to Beasley’s form, The Best of presents several steady grooves and solid improvisational prowess that have made him a favorite in the Contemporary Jazz market. In tribute to Barack Obama entitled “Barack’s Groove,” the lighter than air percussion guides Beasley’s alto saxophone alongside an acoustic guitar breeze. “Go With The Flow” is driven by another unique rhythm track and well-placed female background fills. The Latin-sprinkled, “La Nina” and the techno-drenched “Expressway” focuses on Beasley’s natural soulful ad lib ability. With all these aforementioned gems on The Best, “Ellie’s Theme” (a cover of Isaac Hayes’ Ellie’s Love Theme) provides a slight shifting of the smooth, bridging a touch of modern jazz with several time changes within the music. However, even on The Best, there are a few hiccups, such as the first single, “Come on Over,” where the melodic and percussive substance are somewhat pale. Interestingly, the brand new piece in “Late Night Lover” spotlights an engaging vocal from Raheem DeVaughn, yet Beasley ends up more in a supporting role. Back to more of The Best of, Beasley gets to showcase his very credible tenor voice on two seventies classics: “Lovely Day” offers a refreshing arrangement of Bill Withers’ standout hit and William DeVaughn’s, “Be Thankful (For What You Got).” All in all, The Best of Walter Beasley, The Affable Years, Volume 1, is fairly well packaged as a greatest hits representation of this saxophonist/vocalist’s body of excellence. Four and a quarter out of Five Stars.